We made the decision to attend Chicon 7, the annual World Science Fiction Convention, for two reasons: we would get to spend time with friends we don’t see very often, and we would get to eat in Chicago again. I hadn’t expected to return to Next, but, due to the tireless efforts of our writer friend Scott, we had a table waiting mere hours after our arrival. 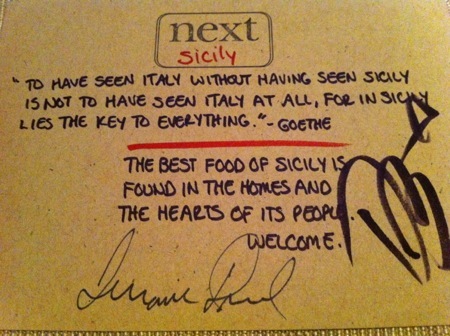 I’m from a Neapolitan family, so seeing Sicily was pretty low on our list when we honeymooned in Italy. I am, however, familiar with the differences in the two cuisines, and was looking forward to what would be served. I’m used to caponata being primarily olive-based, but this version included celery, zucchini, pine nuts, and a bit of bittersweet chocolate in the sauce. The arancine were made from saffron risotto and filled with lamb’s tongue confit. The simple tomato sauce provided necessary acidity. 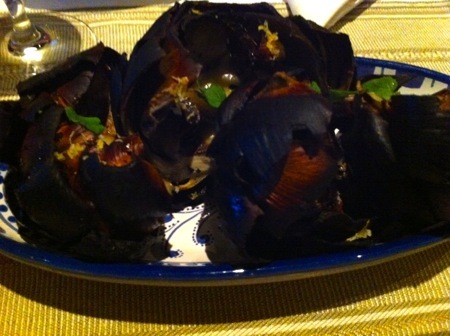 The carciofi alle brace – grilled artichokes – are traditionally cooked over a wood fire. We were informed that this version was prepared “on a Weber kettle in the back.” After scooping out the tender heart, I had to remember how to eat the leaves, which is where the smoky flavor was concentrated (before being transferred to my oily fingers). The reservation had been set up with the non-alcoholic beverage pairing, which, for this course, was a blend of chamomile tea, honey, and saffron. 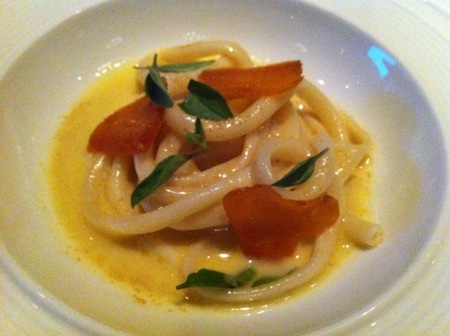 Fresh pasta in a light butter sauce, garnished with two versions of bottarga (dried grey mullet roe): the traditional dried form was grated into the sauce, while a cured form (preserved in beeswax and allowed to age like cheese) was grated over the top. I’d never tried the cured version, it was fishier and creamier than the saltier grated variety. 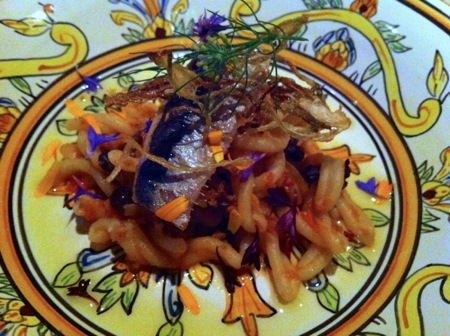 Gemelli pasta and fish is a classic combination; the Sicilian variation uses a grilled sardine filet in place of flaked tuna. The dish was finished with a light tomato sauce and and a drizzle of olive oil. 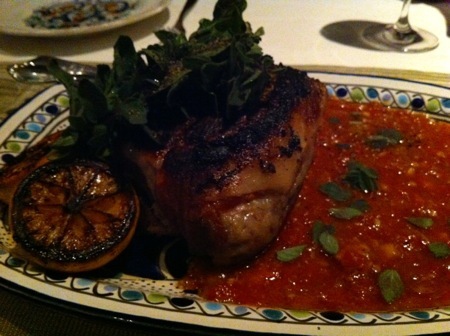 Another fish course, in which the pesce was a thick slab of perfectly cooked swordfish. 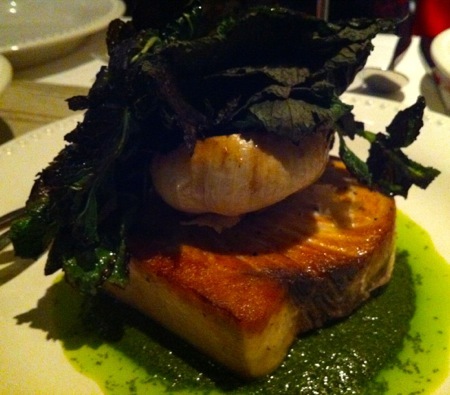 It was served with a mint pesto and garnished with a head of roasted garlic and a clutch of broiled mint leaves. 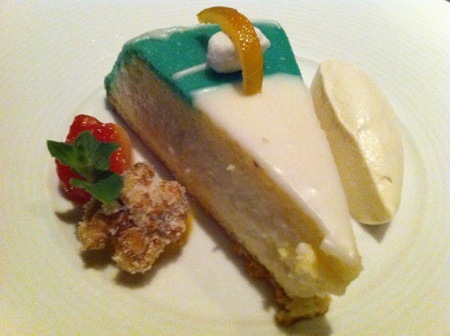 I’ll have to try that fish/mint paring myself, it was a surprising match. 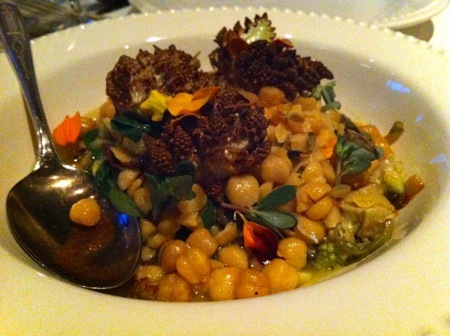 The browned garnish was broiled romanesco broccoli florets. The tomato in this course was provided by the beverage pairing, in this case green tomato juice spiced with garlic and white pepper, assertive enough not to be overpowered by the strong fish and chickpea flavors. I’ve had a few pork shoulders, but none quite as good as this 6-hour braised slab of spalla. The accompanying tomato sauce incorporated the braising liquid, turning this dish onto the Sicilian equivalent of barbecued pulled pork. The grilled Meyer lemon, when drizzled over the meat, brightened every bite. A few of us had seconds, but there was still pork left over to take home. 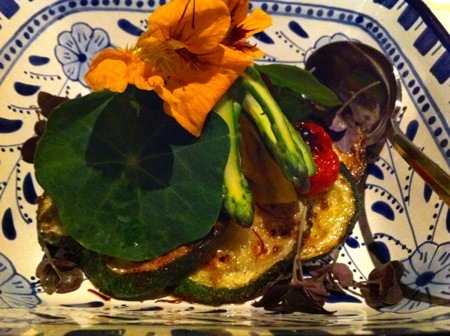 The pork was accompanied by grilled zucchini and cherry tomatoes, shaved asparagus, and nasturtium blossoms and leaves. The drink pairing, in this case a mixture of blood orange and fennel juice, was the best beverage of the dinner, another combination I’ll have to try myself. 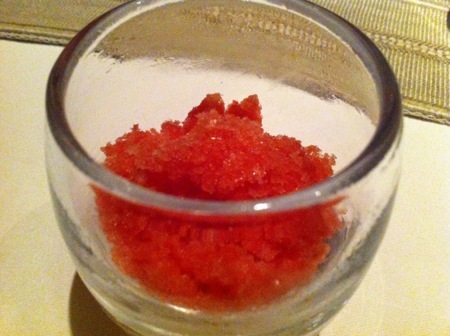 Continuing the blood orange theme, we were served a simple granita as a palate cleanser. Fortunately, we only had a slice, garnished with candied watermelon, candied walnut, and noci (walnut liquer)-infused ricotta cream. The watermelon accent was continued in the drink, a sweet, almost punch-like concoction of watermelon juice and white balsamic vinegar. 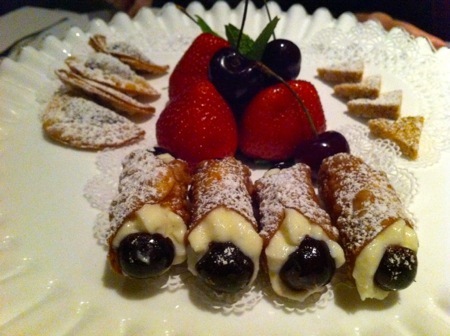 No Italian dinner is complete without pastry miniatures; this was no exception. The fried ravioli encased a sour cherry filling, the cubbaita were little honey-sesame seed cakes. And, of course, some fresh fruit. 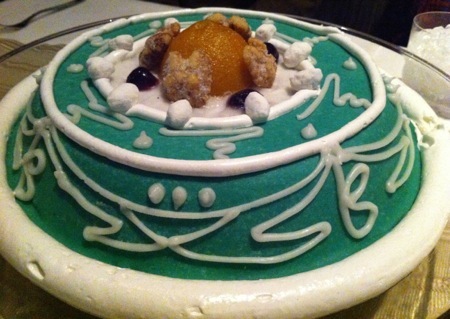 I was struck by the similarities in structure of this meal and last year’s Thailand menu. 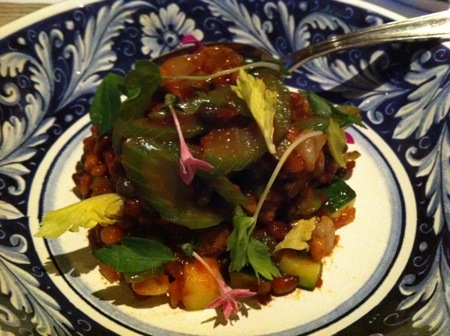 Both began with “street food,” progressed through a fish course, and culminated with a rich braised meat. 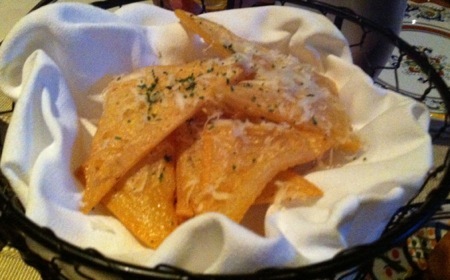 Both were also intensely family-oriented meals, dishes you would find in any local home. The only global difference between the two meals for me was the absence of a novelty factor with the Sicilian menu. I’m getting used to these perfect family dinners; I may have to return again, possibly for the Kyoto menu or the proposed India menu. All I need is another excuse to visit Chicago.